I have teamed up with Home Centre, the largest home retailer in the Middle East, to kick-off its inaugural ‘Women’s Tuesday’ initiative starting on International Women’s Day (Tuesday, March 8th) with a culinary journey that I will host first at their Mall of the Emirates store. Drawing from my just-launched book Plated Heirlooms, I will be getting together with you and will demonstrate the preparation of traditional Palestinian dishes with a modern twist. I will be showing you how to transform a traditional, old recipe into a beautiful canape, that you can elegantly serve at your receptions, pass around cocktail parties or place on a cocktail bites buffet to impress your family and friends. And you will learn how to make 3 different types of canapes on the day with at least 2 varieties to each type. Not just that, but you will also be shown how to apply the same on your own cuisine’s traditional recipes! 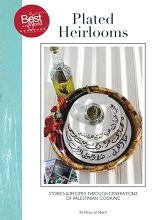 On the day, I will also be having a signing sessions for my book Plated Heirlooms, which features over 250 Palestinian cuisine recipes that have been carefully perfected to be easily replicated at home. So it is a good chance for you to grab your signed copy of this amazing book that will definitely change the way you look at food. Home Centre’s ‘Women’s Tuesday’ initiative that kicks off this Tuesday, March 8th, will run for the entire year. Visitors to Home Centre stores across the region are invited to indulge in wholesome retail therapy week after week. In addition to exclusive discounts, women shoppers can enjoy a host of dedicated privileges, including personalised shopping assistance, free home delivery, complimentary trolley assistance and an exclusive billing counter.